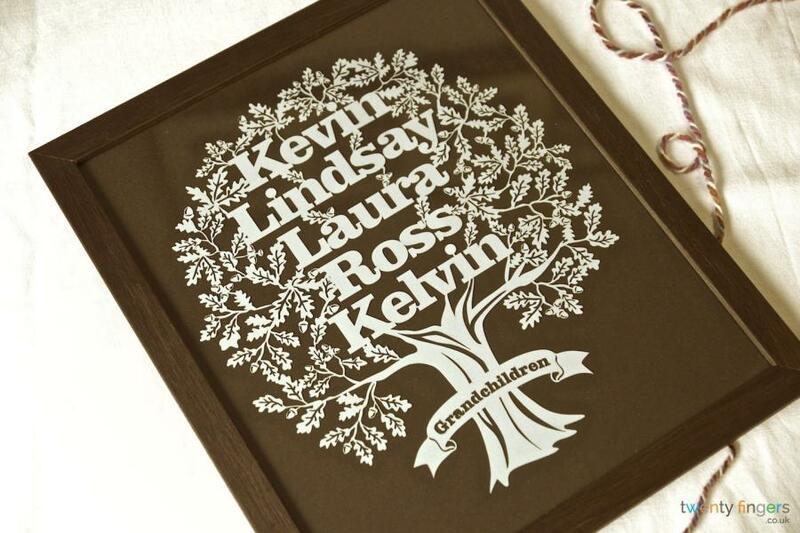 Family Tree Papercut in a Traditional Frame. Beautiful gift for many occasions! Family is the most important aspect of living. Our family has helped mold us into the people we have become. We are all individuals, but without our family we would be, in a way, less than we are. Whether you have one of those perfect television families or it is full of crazy people, we all love our families and we love to commemorate our family members. People love to be immortalised in a variety of ways. 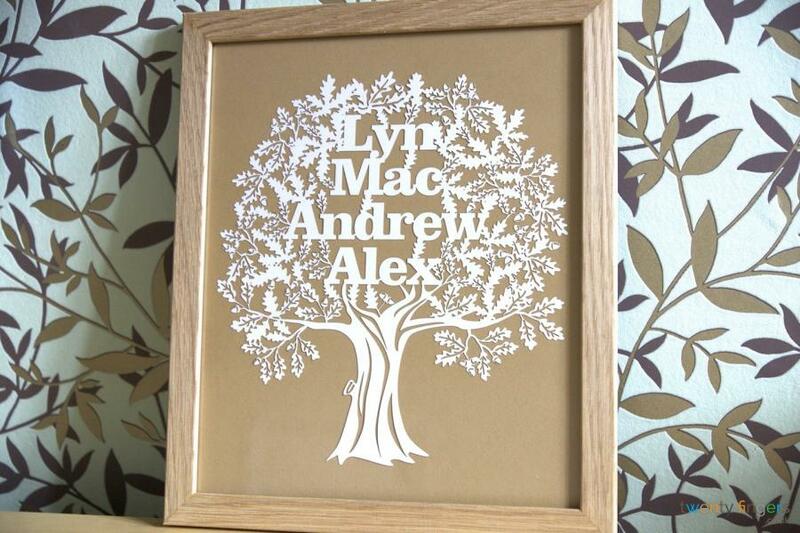 Our Family Tree Papercut is a way to commemorate and immortalise your family members. Family is a strong aspect in our lives. To symbolise strength we have chosen the oak tree as the vehicle to hold the names of the family. 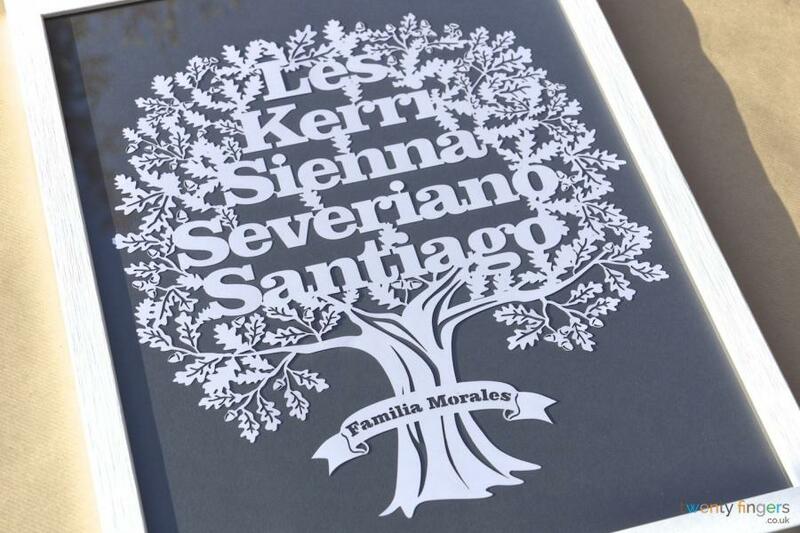 The first names of family members are etched into the branches of the tree with the family name being embossed on the trunk. It can be difficult to choose the perfect gift for certain members of the family. Face it; there are just some members of our wonderful family that are a bit more on the picky side. 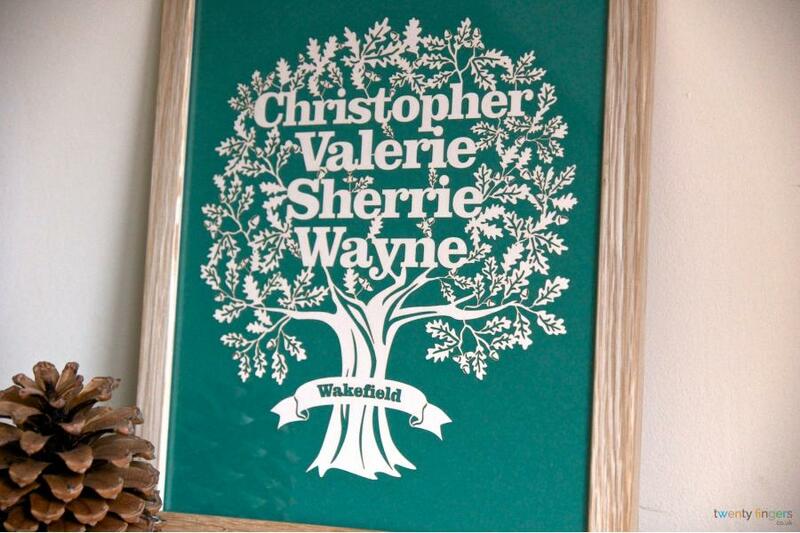 Rest assured that the Family Tree Papercut from us will satisfy even the choosiest of people. Why does this particular gift satisfy such a wide variety of people? 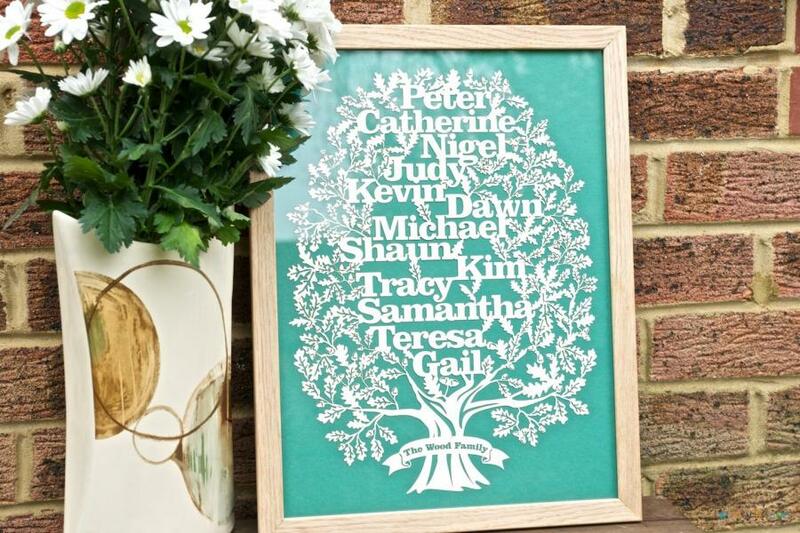 For Many Occasions – The Family Tree Papercut is perfect for a wide variety of occasions. It is not specific to simply Christmas or Mother’s Day. 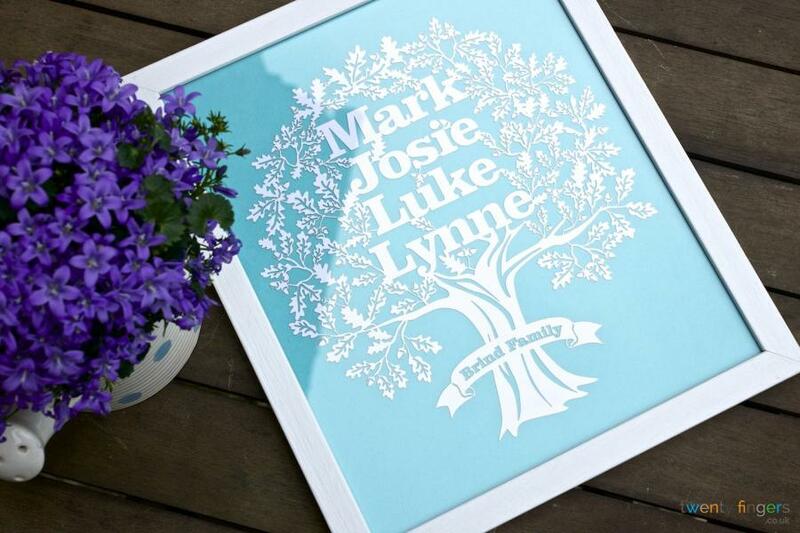 The Family Tree Papercut is good for any holiday, birthday, or just because. 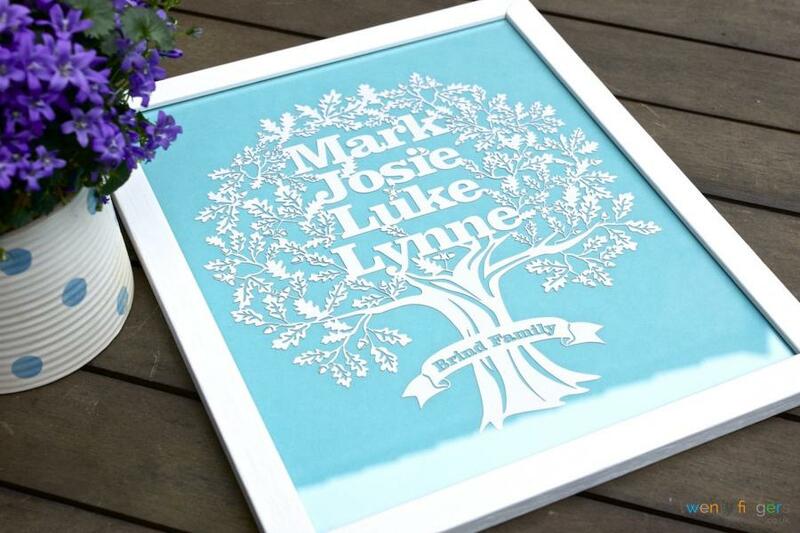 Personalised – The Family Tree Papercut is personalised to each individual family. Up to 9 names can be added to each papercut. Easily Matched – It can be a difficult task to match a particular décor. 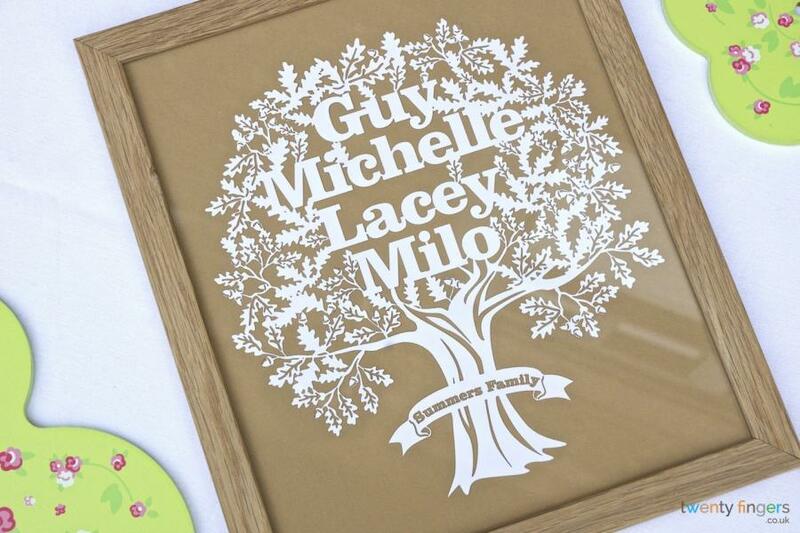 Family Tree Papercuts are made from neutral colours that match any colour scheme. 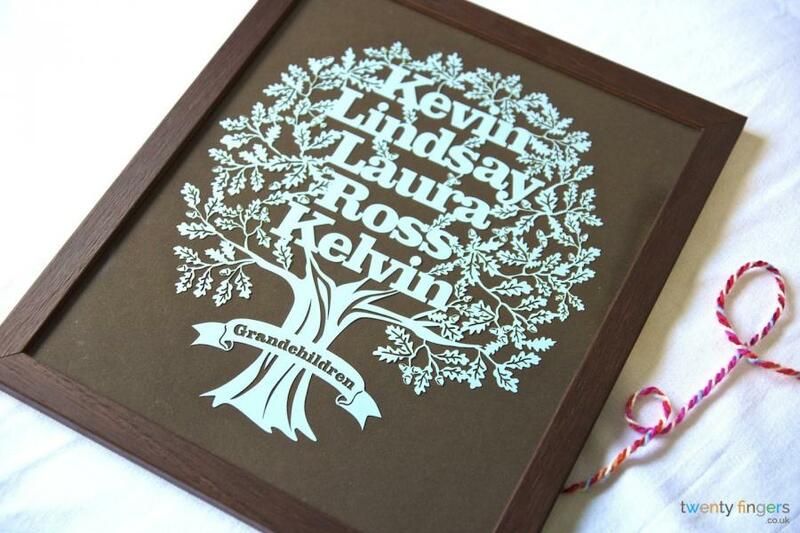 Your Family Tree Papercut will last for generations and honour the names of all of your family members. Every time family comes to visit they will admire this stunning piece of family history hanging on the wall for all time. I ordered a large family tree yesterday and it has just arrived, within 24 hours - love the speedy service! I am so happy with the tree, it looks beautiful and will make an excellent birthday gift. Thank you so much for your excellent service and a truly great quality product. I ordered it for Father's Day and my Dad loved it - it was a really unique gift. I wanted to find something personalised from the children to my husband for Father's Day. Twenty Fingers produced a gorgeous family tree which he loved. It arrived beautifully wrapped and in plenty of time. Would highly recommend to any of my friends. Thank you. I was so pleased with my purchase of a family tree. It was beautifully made and wrapped. It made a perfect gift and was delivered in excellent time! I would definitely buy from twenty fingers again and recommend them to a friend. Beautiful and really pleased with the service and packaging excellent! All wrapped up as well which was lovely!! Would recommend highly! I was so impressed with my first purchase that I've bought 2 more. They're such lovely, individual works of art and I know I'll be buying more in the future. ordered a family tree for me and a large one for my mum with all our names on. Order easy to place, contact made straight away, and my pictures arrivd yesterday. They are beautiful and I am so pleased. Can't wait for my mum's birthday so I can give it to her! Great service, well packaged and fantastic product. Very pleased, thank you.